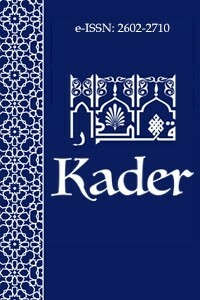 Kader started publishing in 2003 in the name of KADER Kelam Araştırmaları Dergisi (e-ISSN: 1309-2030). The name of our journal has been changed to Kader (e-ISSN 2602-2710) on 24/10/2017. KADER is an international academic journal published two times (June and December) a year. The papers due to be published are carried out on the principle of double blind review. The papers are verified by plagiarism detection program that they do not contain any plagiarism and that they are not previously published. The journal provides to publish high quality research papers, and besides them, translated papers, research notes, book and dissertation reviews, evaluations of academic activities such as symposiums, congresses and workshops and works such as edition critiques and text simplifications in Kalâm (Islamic Theology) and interdisciplinary fields related to Kalâm. Each paper to be submitted must contain to abstract in both Turkish and English between 150 and 250 words. In the event that the referee reports are favorable and the decision is made to publish the article in our journal, a 750-1000 word extended English summary will be requested from the author. KADER is indexed in EBSCO, SOBİAD and TDV İSAM paper databases. Why Muslims Become Instruments of Terror?